A few years back, we got Saving Mr. Banks, a film that explored how P. L. Travers created Mary Poppins and how her character became part of the Disney family. Goodbye Christopher Robin does something similar for Winnie-the-Pooh, although it cuts the Disney machine out of the equation. Like Saving Mr. Banks, however, this is a lovingly crafted period drama about the link between family and the creative process. For many people, Winnie-the-Pooh will always be a source of comfort, much like how children find solace in a teddy bear or how Pooh looses his troubles in a pot of honey. Behind these children’s tales, though, there’s also a gloomy raincloud. Out of all the actors behind the Weasley children, Domhnall Gleeson probably got the least amount of screen time. Yet, he’s ironically gone on to have the most fruitful career, appearing in several movies this year alone. He gives one of his best performances as A. A. Milne, an author and playwright troubled by his memories of World War I. Much to the frustration of his wife Daphne (Margot Robbie), Milne wants to write a book about the horrors of war, but can’t quite find the words. Since Milne and Daphne are wrapped up in their own worlds, they pay little attention to their young song Christopher Robin (Will Tilston). The most loving parental figure in Christopher’s life is his nanny, exquisitely played by Kelly Macdonald. Left to look after Christopher on his own for a while, Milne finally gets to know his son and his friends. In addition to a teddy bear, Christopher has a donkey named Eeyore, a tiger named Tigger, and various other stuffed animals. Christopher is also quite fond of a black bear he encountered at the London Zoo named Winnie. As Milne takes walks with Christopher in the woods, the two create a whole world that’s so simple, and yet so magical. Upon putting the Hundred Acre Wood to paper, Milne inspires his readers in ways he never thought possible. As Milne offers others a reason to smile, however, he strips Christopher of his childhood. Winnie-the-Pooh not only drives Milne further away from his son, but also throws Christopher into the spotlight. This is where Goodbye Christopher Robin really starts to get interesting, delving into how fame affects children. Over the years, we’ve seen a lot of kids rise to superstardom far too quickly, depriving them of a proper upbringing and shattering their futures. What’s ironic is that Winnie-the-Pooh is the epitome of childhood. Whether you’re reading one of Milne’s books or watching one of Disney’s animated adaptations, Pooh never fails to take one back to their youth. In order to get to this point, though, Christopher Robin had to let go of his childhood. The dynamic between Milne and Christopher is reminiscent of Travers’ relationship with her father. While there’s a great deal of love between the two, there’s also underlying issues that’ll always haunt them. Alex Lawther is especially strong as an adult Christopher, who’s ready to go to war just to escape his father and the fictional character associated with his name. 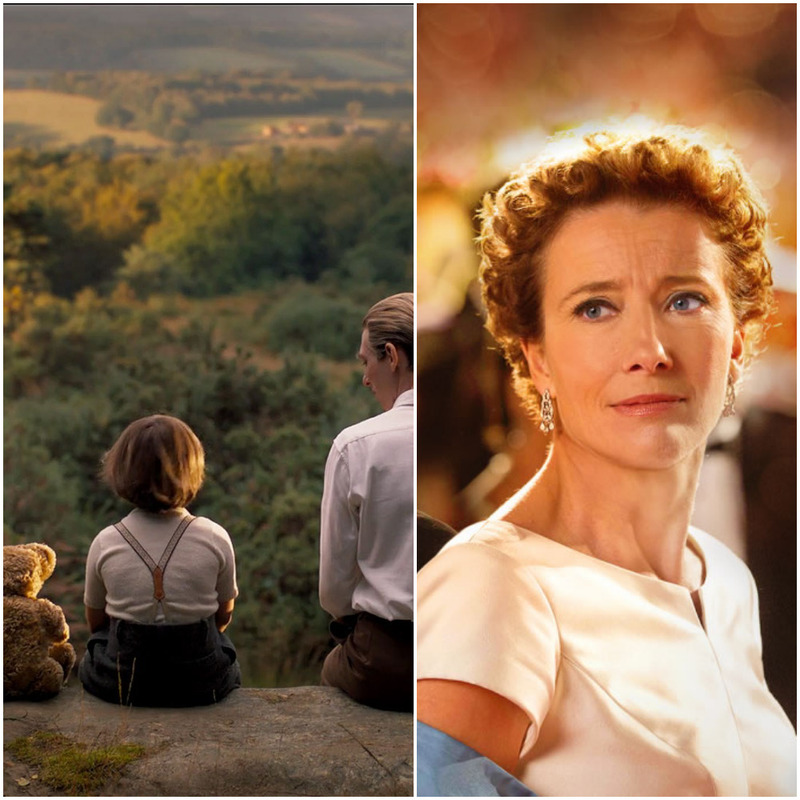 Goodbye Christopher Robin and Saving Mr. Banks present us a harsh realization. Winnie-the-Pooh and Mary Poppins will last forever, delighting countless children and adults. Yet, both stemmed from childhoods that took surprisingly dark turns. When life gives you lemons, though, you can always make lemonade. Likewise, you can always make honey when life gives you a beehive. This entry was posted in Features and tagged Biography, Family, History on October 13, 2017 by Nick Spake.